Visitors to Wentworth Court may have been served a cuppa and slice of cake by our smiley volunteer, Tom Larsen, who is a favourite with residents and staff alike. Tom has been volunteering with Wentworth Court for two days a week since the Spring. 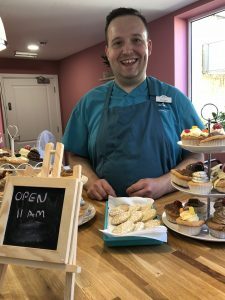 From helping to bake cakes to washing up and serving in the café bar, Tom is an asset to catering colleagues as well as helping out with trips and activities. Tom, who has additional needs, has been supported all his life by carers and is very happy to be giving something back by helping others at Wentworth Court. We have many opportunities for volunteering to fit with your skills and interests. We’d love to hear from you if you could help with activities from reading to residents to helping with our garden or driving our minibus. Please get in touch with Suzanne by emailing suzanne.meadows@wentworthct.com or call 01242 2263332.